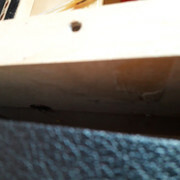 I have a Rhodes Stage 72' and I decided to start a new topic to group all the doubts that arise during the restoration. Now I have discovered that the harp support has been glued and I want to replace it for a new one (I think it's made in maple) but that's not all... the action rail is shimmed laterally because there is a gap between the harp support and this. Any consideration with this? 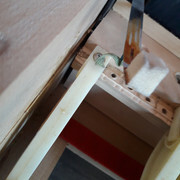 I have adjusted the key dip putting one of this felts (but unglued) between the pedestal and the hammer in three points of the piano (extremes and middle) setting the key dip at 9,5 mm. , and now I have to raise the keys shimming the balance rail to get eighth inch of the key cap hidden by the key slip. The keys was leveled previously but having more than eighth inch of the key cap hidden. The question is: Could I shim two extremes and a middle keys with and unglued felt between key pedestal and hammer to get a reference and know how this keys would be if they had eighth inch of the cap hidden and felt and then level all the piano keys? The lateral shimming you talk about was done at the factory. During this era, that's how they dealt with alignment of a wood action frame piano. Replacing the harp support may be a good idea, depending how good the glue job was. It can change the escapement of the bass section of the piano due to a height difference. I'm not sure if I follow you on the key dip / key pedestal felt question. Your era of piano with wooden harp supports, would have key pedestal felts (not hammer cam felts). When doing the miracle mod, you'll want to remove the key pedestal felts, do the bump mod, and reinstall new key pedestal felts. If there are no felts between the key pedestal and hammer currently, this will allow the keys to dip lower than they should when depressed. The ‘72 should have hammers that are plastic and wood, and there should be no felt on them. If I understand what your saying, you took the felts off the key pedestals. That’s fine as you need to do that for the mod. Glue the plastic bit onto the key pedestal and then apply new felts. This will change the key dip quite a lot, so you probably want to do this mod first. The felt on the key pedestals must be glued down to the key, not the hammer. Over the plastic mod piece. I guess I don’t understand why you want to replace the harp supports. Are they too tall, too short, holes stripped out? They can be shimmed if needed and often were. We’re there black shims on top of them? It’s not clear to me what you are trying to show in the pics. Best of luck, and have fun. I really enjoyed restoring my ‘74, which I think is similar to your ‘72.